Trump froze the $230 million in March, threatening to withdraw United States forces from Syria, subject to a review to reassess Washington's role in the brutal seven-year-old conflict. The United States said on Friday it had secured $300 million from coalition partners to help stabilize parts of Syria retaken from ISIS, after President Donald Trump demanded that allies help carry the costs of the war. The State Department said it would redirect $230 million in frozen funding for Syria to other unspecified foreign policy priorities, while emphasizing that the move did not signal a retreat by Washington from the Syrian conflict. Whether or not the coalition money will convince him to stay is unclear. The State Department named veteran U.S. diplomat and former ambassador to Iraq, Jim Jeffrey, as U.S. Secretary of State Mike Pompeo's adviser for Syria, a role that will include overseeing the U.S. role in talks aimed at a political transition in Syria. While Washington has long insisted that Syrian President Bashar al-Assad should go, the Trump administration appears to have accepted that Assad could remain until the end of his current seven-year presidential term in 2021. Brett McGurk, the U.S. special envoy to the coalition fighting against Islamic State, will remain in his role as the U.S.-coalition prepares to clean up the last remaining militants in an area around the town of Hajin in eastern Syria. "We still have not launched the final phase to defeat the physical Caliphate. That is actually being prepared now and will come at a time of our choosing, but it's coming," McGurk, the U.S. special presidential envoy overseeing the fight against Islamic State in Syria and Iraq, told reporters. Acting U.S. Assistant Secretary David Satterfield said the United States and other countries would not contribute to Syria's full reconstruction until there was a "credible and irreversible" political process underway to end the conflict. "There is not going to be by international agreement reconstruction assistance to Syria unless the U.N. ... validates that a credible and irreversible political process is underway," Satterfield told a conference call. Both the Russian and Syrian governments want international funding to rebuild Syria, he said. Russia joined the war on Assad's behalf in 2015, turning the momentum in his favour. Assad also enjoys robust support from Iran and Lebanon's Hezbollah. McGurk said Saudi Arabia had contributed $100 million and United Arab Emirates had pledged $50 million in donations to stabilizing programs. Australia, Denmark, European Union, Taiwan, Kuwait, Germany and France also participated, he said. "We are remaining in Syria. The focus is on the enduring fight against ISIS," said McGurk. In its early stages, the war shattered Syria into a patchwork of areas held by different forces. The fighting has killed hundreds of thousands of people and forced more than half the pre-war population from their homes. 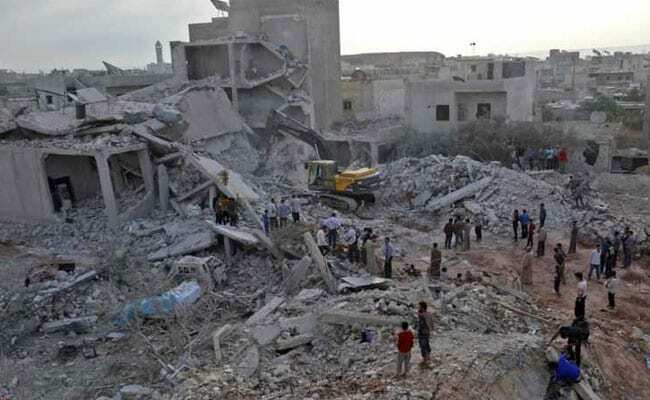 A report by the U.N.'s Arab countries agency ESCWA has cited experts as saying the volume of destruction of Syria's physical capital and its sectoral distribution exceeded $388 billion.